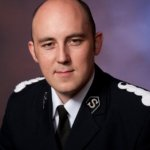 The Enfield Citadel Band announced on 6 September 2016 that its Bandmaster, Dr. Jonathan Corry, has relinquished his leadership of the band and will be taking up an appointment as Director of Music and Gospel Arts for the Chicago Metropolitan Division in the USA Central Territory. No successor was immediately named for the conductor’s post at Enfield. Conducting the band since September 2008 and commissioned as Bandmaster in 2009, Corry provided the group with opportunities to tour in Europe, most recently returning to his homeland in Ireland. During his tenure the band made five innovative recordings featuring a number of new works. Perhaps the most notable of these was a soundtrack to the 1909 silent film The Salvation Army Lass with music by Dorothy Gates. This pace-setting, 17-minute work for brass band and piano was issued as part of the combined CD/DVD recording Faith, hailed as another “first” for a Salvation Army band. Bringing new composers and compositions into the band’s repertoire has always been a part of Enfield Citadel Band’s ministry. Under Corry’s leadership, the band premiered new works by composers such as Dorothy Gates, David Catherwood, Martin Cordner, Roger Trigg, Peter Meechan, Philip Wilby, Andrew Wainwright, and Ray Farr. Another example will be premiered at the annual Pre-Contest Festival on 7 October 2016. A new work was commissioned by Corry from composer Tom Davoren. The piece, entitled Living Power, is the first Davoren composition written for a Salvation Army band, is dedicated to Bandmaster Corry. The band will be led at a concert at Long Melford and the Pre-Contest Festival by Bandmaster Iain Parkhouse of Croydon Citadel. The Enfield band expressed thanks to Croydon Citadel for allowing Bandmaster Parkhouse to assist in this way. Rehearsal duties will be split between Bandmaster Parkhouse and retired Bandmaster Don Jenkins as the search for a new leader is conducted. This article was posted in News and tagged Andrew Justice, Andrew Wainwright, appointment, bandmaster, Chicago, Chicago Metropolitan Division, David Catherwood, divisional music director, Don Jenkins, Dorothy Gates, Enfield Citadel Band, farewell, Garry Ambrose, Iain Parkhouse, Jonathan Corry, Martin Cordner, Peter Meechan, Philip Wilby, Ray Farr, Roger Trigg, Tom Davoren on 17 September 2016 .